I wrestled with this blog for days. It was really hard to put how amazingly awesome Lynne is into a blog post that's not too long. I can't even put our conversation into words. Really you just need to meet her in person. She has this way of dropping inspirational sh*t on you like BOOM and then you’re all like “I can take over the world because Lynne said!” It's great. Ok, on to the blog. In preparation for our interview, Lynne took a Buzzfeed quiz to find out what her spirit animal was. A spider they said. It wasn't until we were chatting about the fact that Lynne moonlights as a backup singer in a band that she realized Cher was actually her spirit animal. Cher...circa 1974 to be exact. She starts making these invisible hair flip motions as she contemplates the discovery of her long-haired counterpart. This is Lynne. 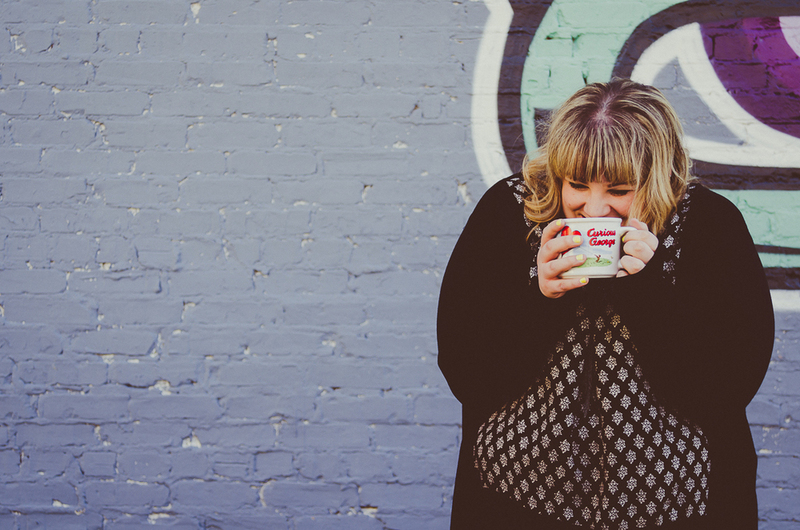 Boss lady, coffee connoisseur, art curator, (comedienne?) and blond glitter bomb. She hails from Newcastle, across the pond in England (that’s the saying right? ), and you can hear her accent when she says words like 'garage'. Love it, made her say it 3 times. 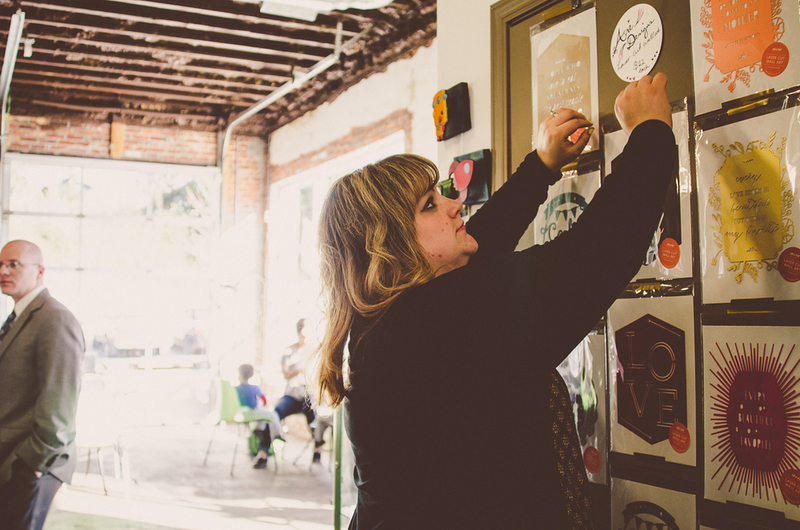 She is the Co-Owner and Creative Director of Hodgepodge, part coffee shop, part art gallery, 100% awesomesauce. Lynne and Co-Owner Krystle have been slinging coffee and creativity here for the past 3 years now. 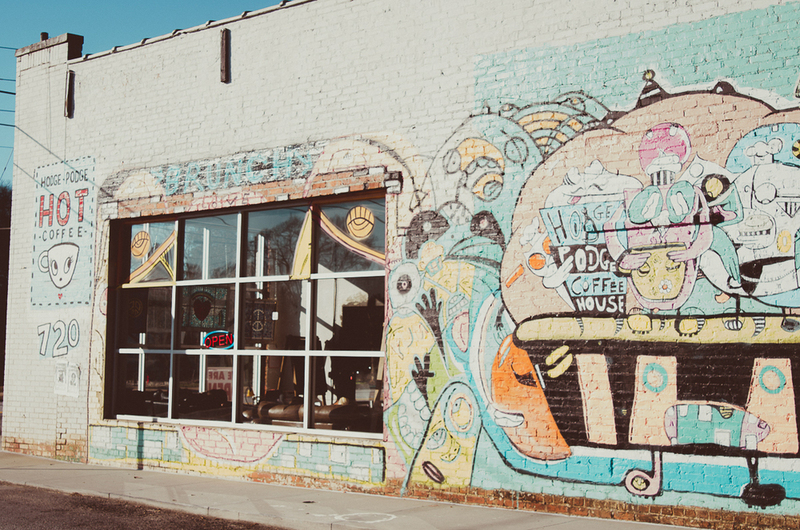 Aside from producing some of the best coffees this side of I-20, every month Hodgepodge features a new artist in the gallery. Lynne finds the artists and hangs every piece of art herself. During our shoot, I told her to do something that she would normally do. So she grabs a hammer and starts hanging stuff. I think she loves that. Some phenomenal artists have come through those doors, like sQuishiepuss! 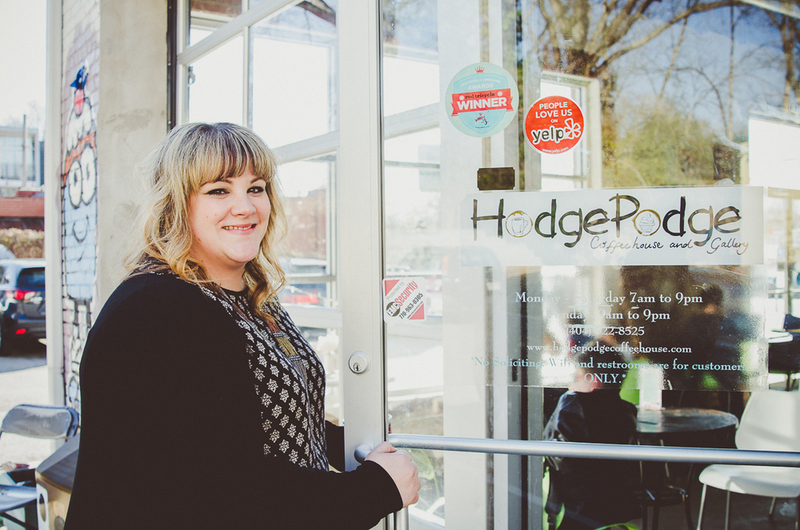 Hodgepodge is an amazing community-driven coffee shop and gallery. If you haven't been, you need to visit. Bring a screenplay to write too. People like to write screenplays here. Before Hodgepodge, Lynne worked for a well-known cosmetics company. Unfortunately, that company made it clear to Lynne after a while that she didn't 'fit'. 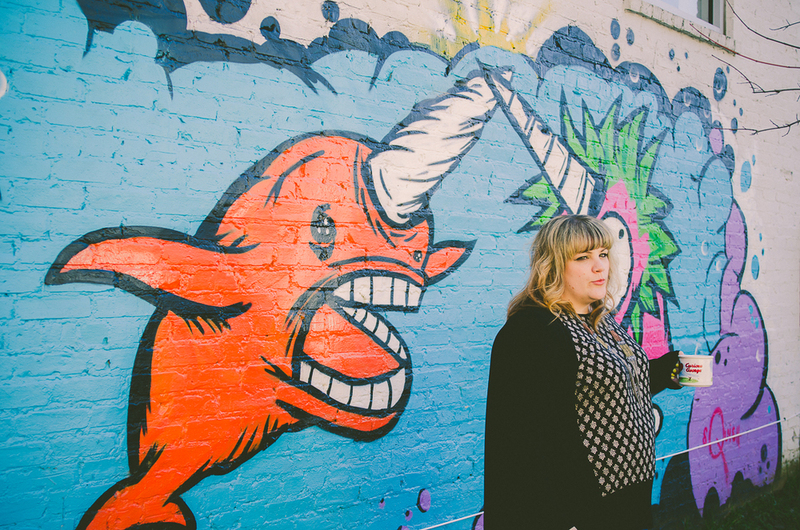 As you can imagine, most #girlbosses have this thing about not sticking around where they aren't wanted, so knowing that there were indeed bigger and better things out there than working for a crappy company, she left. 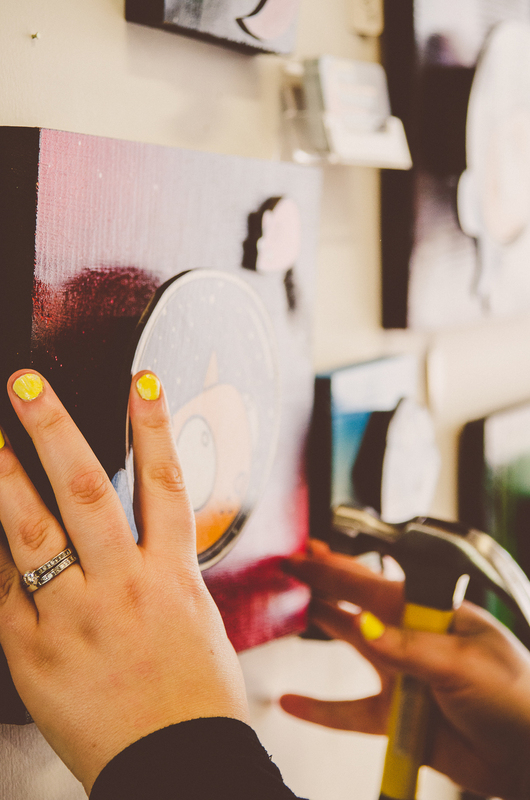 And after a year or so of all-hands-on-deck revamping of a fabulous, vintage garage..Hodgepodge was born. My time with Lynn was pure joy. We have so many things in common, one being that we both share a passion for empowering women. After about 5 minutes of talking, Lynne’s ‘interview’ turned into me, Lynne and Betsy (her friend and moral support, she was nervous at first, crazy, I know) just chatting it up, sharing experiences, and a whole bunch of ah-hah moments and laughs. One thing Lynne shared with me regarding female entrepreneurs was that many of us start out as lone wolves, and although a lone wolf can definitely handle herself, it's nice to find like-minded people to run with. Sometimes running in a 'pack' of equally strong, fabulous individual wolves can be far more effective than running by yourself. You should read 'Women Who Run with Wolves' by Clarissa Pinkola Estes btw. A piece of advice Lynne would give women thinking about owning their own business would be that once you are in the position to hire a small team, it’s imperative to hire people that truly match your mission statement. As your business catches fire, you can try to continue to handle everything yourself, but not to the point of burning yourself out. At that point, you'll need people you can trust to run things the same way you would. Singing backup in a band is therapy for Lynne. Journaling is mine. Another thing we have in common. Journaling, not singing in a band. I asked Lynne what keeps her motivated, what gets her to get out of bed in the morning. Lynne’s response: "The promise of another coffee." Touché. I think her two-year old holds a spot somewhere in there too. Other things that inspire Lynne include art (of course), reading blogs (you don’t say?) and road trips. “Funyens, cherry coke and the open road" she chirps. Many, many wonderful photos await you. Disclaimer: a majority of these were accompanied amidst heavy laughter. Enjoy.